Order your Birthday Plaid Project Pack today! Every time I stitch or design a birthday plaid, I am excited all over again. This gift is about as unique as you can get. You can make them for anyone of any age and for any occasion. The template for the mini-sock is included in the project, but I have also made boxtops, wallets, and I’m thinking about making a pillow for our family room. You’ll love how easy and clear the instructions are and how any stitcher can make this project. The PDF version of the project is $12 and the printed version is $13.50. Use the button above if you want the project as an ebook (PDF format). Use the button above if you want the project as a printed book. Printed books are sent First Class in the US and cheapest way Internationally. If you want another method, indicate it. You will be invoiced for additional costs. This is a wonderful idea. My mind is bursting with projects for gifts/presents. A quick question for you. 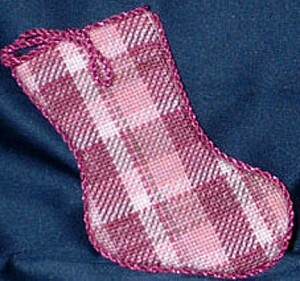 What are the dimensions for the birthday plaid mini-sock project? Could the template be used with cross stitch?